Mind the game is specially designed for couples and small teams, up to a maximum of five people. Mind The Game offers lots of fun and a very memorable game. The aim of the game is to find the ‘unfinished serum’ and get out of a professor’s study within 60 minutes by solving puzzles, riddles, hints and mysteries. Requires observation, teamwork, creativity, communication and courage. No hard physical exercises or scary elements are involved. Just think outside the box. 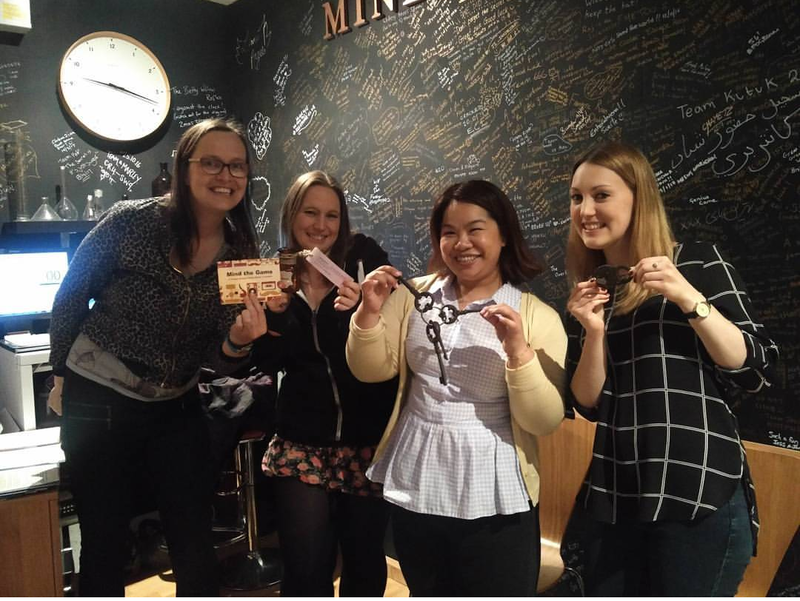 Thanks to Mind the Game who some members of Love Pop Ups London community come down to experience such a fun and mind boggling escape room. Read all blogs/reviews from the comments section below. What a great experience, this is a lovely escape the room game, it is not too difficult to have you falling out with each other but it’s not too easy for you to wiz through it. Its run by a lovely couple who make you feel at ease and welcome from when you enter the door, the experience is based in one room, but there are a lot of different treasures hidden in ways I haven’t seen before in an escape game. It is suitable for small groups and couples, and most defiantly will give you all a great hour of enjoyment and fun. We were a team of 4 and we escaped with 6 minutes left to spare and had to ask for 4 clues. We all had a part to play and helped with at least one section of the game, all ultimately working together as a great team. It’s about an 8-minute walk from Queen’s park tube and Brondesbury park overground and about a 14 min walk to Kilburn tube. It’s easy to spot as its based on the corner of Willesden lane. They can also personalise things as they are small, they told us a story of a couple that did this and the guy asked them to hide the ring in the final place were the keys are to break out, which I think is a beautiful idea and so romantic, what a great proposal . So if you have anything special you want to say to someone or have a little idea, I am sure if you run it past them they will try and accommodate if they can . I told everyone at work the next day what fun we had and 5 people are already going to book up and these people are of all different ages and interests- it’s a great experience for any type of personality . Enjoy if you do book and good luck!! What a great fun game. Situated in West London, time is ticking to escape before the nutty professors formula blows up. The challenge is on! 60 minutes to escape.. or else you will be locked in with the lab forever! What sets this escape room apart from the rest are the 2 lovely people who run it. They are obviously very passionate about what they have created – and rightly so! They are so friendly and welcoming with enthusiasm which exudes as they talk you through the puzzles once you have escapes (and also tell stories of other families, couples and groups of friends experiences). The venue is super tiny with just 1 small entry area and then the room itself. It is designed for up to 5 people however unlike most other escape games is suitable for couples as well (once they even popped an engagement ring in one of the locked boxes – amazing). The game itself had a great theme centering around a missing professor who had created a serum which could be fatal in the wrong hands. Our job as the lab analysts was to find it (which we did with 6 minutes to spare- wohoo) where it had been locked away in his office. There are tonnes of puzzles of different types which are set out brilliantly and all interlink. The room is also fantastically decorated so don’t be deceived by the slightly shabby exterior room. At £80 for 5 people it is great value especially compared with something other escape rooms like Time Run. I can’t recommend enough! A massive thanks to Love Pop Ups – London and Mind the Gap for inviting me to experience it.